Pig Tales: An Omnivore’s Quest for Sustainable Meat by Barry Estabrook gives you the inside scoop on all things porcine, from wild hogs to pastured domesticated hogs, and hogs that spend their entire life in a building. I won an advance reading copy in a drawing but ultimately wound up purchasing the audiobook and listening to it on a recent trip. The book starts out telling you the basics about pigs, including how intelligent they are. If you’ve ever raised pigs, that should not come as a surprise to you. Estabrook goes on to talk about feral hogs, how their range has spread to most of the U.S., and how they have become a terrible nuisance in some areas, easily rooting up acres of newly planted farmland overnight. Part two of the book is appropriately called “Life as a Protein Product,” and Estabrook tells us about his visits to a variety of pork producing farms. His visits to confinement operations in the U.S. didn’t surprise me much. I’ve heard of how badly they stink and that when entering and leaving, you have to shower and change clothes for biosecurity reasons. It seems like you would not smell like pig manure afterwards, but apparently you do because the smell permeates your skin and hair. He also visits with families whose lives have been made miserable by the stench after hog confinement operations were built near them. Ironically, the people who own the confinement operations do not live on their property, yet they expect others who live near them to just deal with the odor. Then, the book covers legal battles that have taken place between landowners who want their little piece of heaven to stay odor free and huge corporations that act like it’s not such a big deal to live near a confined hog operation. In addition to odor, these places also contaminate ground water — and not just for rural neighbors. Water in the City of Des Moines has had dangerous levels of nitrates and trihalomethanes (THM) because pig waste winds up in rivers and streams. Excessive amounts of THM in water can cause damage to the liver, kidneys, and central nervous system. At times, the city has had to put five to six times as much chlorine in the water as normal in order to kill the excessively high levels of bacteria. And this is just the beginning. There’s a great chapter on drug use in factory farms, which is normally put in pig feed daily. At the end of this year, that practice is supposed to be illegal, but no one is sure if it will really cut down on the use of antibiotics. If a farmer has a prescription from a veterinarian, he will still be able to use them, so it will depend on how freely vets will write out prescriptions. The most interesting part of the book for me was when Estabrook visited a confinement pig operation in Denmark. Even though they have pigs in buildings, things are very different. The area surrounding the farms are not filled with odor. In fact, the farmer and his family actually lived on the farm that he visited. 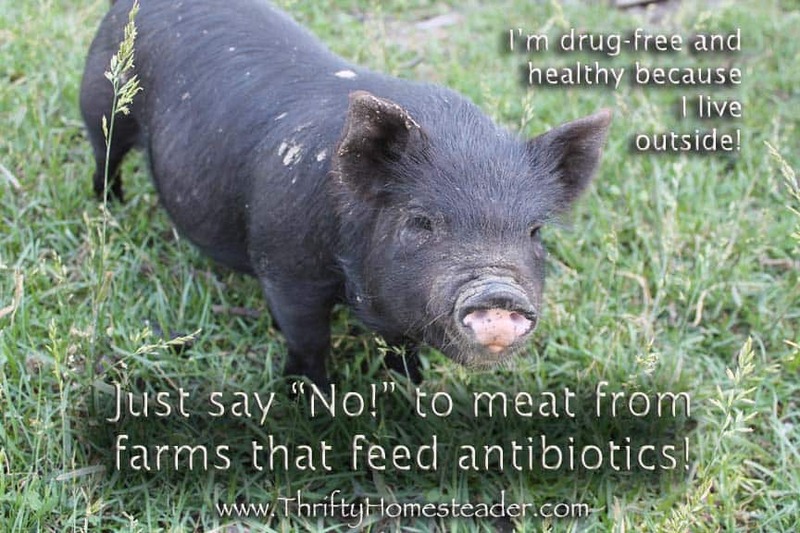 Farms in Denmark also do not routinely feed antibiotics, and their pigs are healthy. The book ends with pastured pork farms, which I’m very familiar with. We’ve been raising pastured pigs ourselves since 2004, so I didn’t find a lot of new info in this section, but it’s always interesting to hear about other pastured farming operations. Overall, I highly recommend this book to anyone who is either a consumer or a producer of pork.